1. Preheat the oven to 200°C, gas mark 6. Scatter half the tortillas over a large ovenproof dish or platter. Top with half the cheese. Repeat with another layer of the chips, then scatter over the pork in a single layer, followed by the jalapenos and remaining cheese. 2. Cook in the oven for 5-6 minutes, or until the cheese is totally melted and the pork is piping hot throughout. 3. Meanwhile, halve, stone and peel the avocado. Mash the flesh in a bowl with the lime juice, a generous pinch of salt and freshly ground black pepper until combined into chunky guacamole. 4. Remove the nachos from the oven. 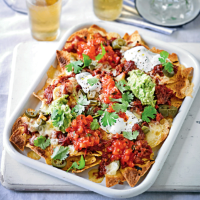 Serve immediately topped with the guacamole, salsa, soured cream and coriander leaves.